First part of my project was writing Windows Shellcode, It was great part to learn about shellcode as I didn't have much knowledge about shellcode before I started contributing to ZSC. I had to work on other obfuscation modules but as ZSC tool got accepted in DEFCON we had to make Windows Shellcode part complete as that was to be presented. There were no encoding modules for Shellcode but as it was needed to complete Windows Shellcode part I started working on Encoding part. It was great experience to work on ZSC tool as I learned many things about exploits, Shellcode etc., I would like to thanks OWASP Organizations, my mentors Brian for helping me to learn about shellcode and clearing my doubts, Johanna is great leader who is doing everything she can for ZSC and also Ali for helping me with project, also reviewing PR's and for creating this tool :). GSoC will be ending but I will still be contributing to ZSC tool. Next couple of months ZSC tool will be still having new changes as it is likely to participate in BlackHat Arsenal EU (Johanna applied for it already) and we can add some new features to the tool. Also we have working API and osx shellcode added to tool. Thanks to Akash Trehan for adding osx module. So there are lots of things added to tools in last 2-3 weeks. Everyone is actively working for the tool. So in my last post I completed Download to file shellcode and after that I added couple of shellcodes like add admin and disable firewall. All the shellcodes in the tool can be seen here. 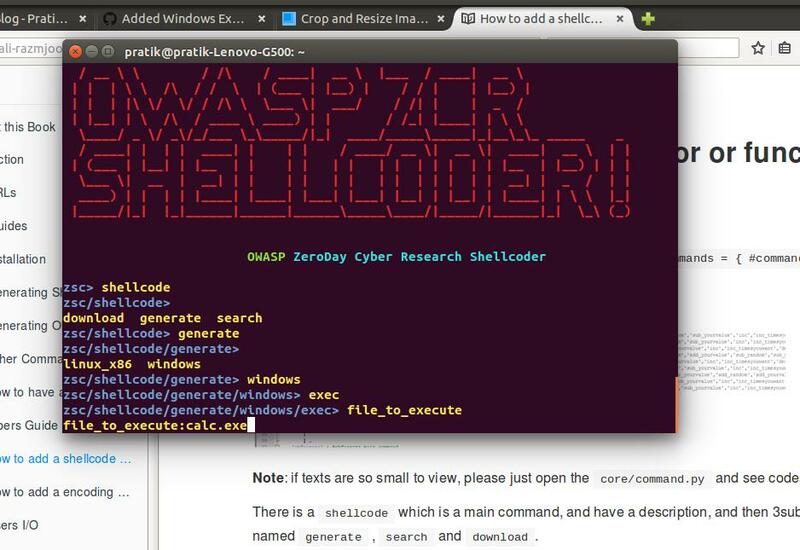 As the org was selected for DEFCON 2016 we wanted to complete windows shellcode with encoders and also add osx shellcode. So in place of starting some complex obfuscation method I started working on encoders for windows shellcode. I added xor_random, add_random, sub_random and xor_yourvalue. I also have done add_yourvalue but we are trying to fix this issue before I add other encoders to the tool. All the PR's made by me can be found here : https://github.com/zscproject/OWASP-ZSC/pulls?q=is%3Apr+is%3Aclosed+author%3APratik151 if you want to look at code. Also zsc tool now has osx shellcode also thanks to Akash Trehan. He added osx shellcode to the tool. Also thanks to Ali, Brian and Johanna for helping me. 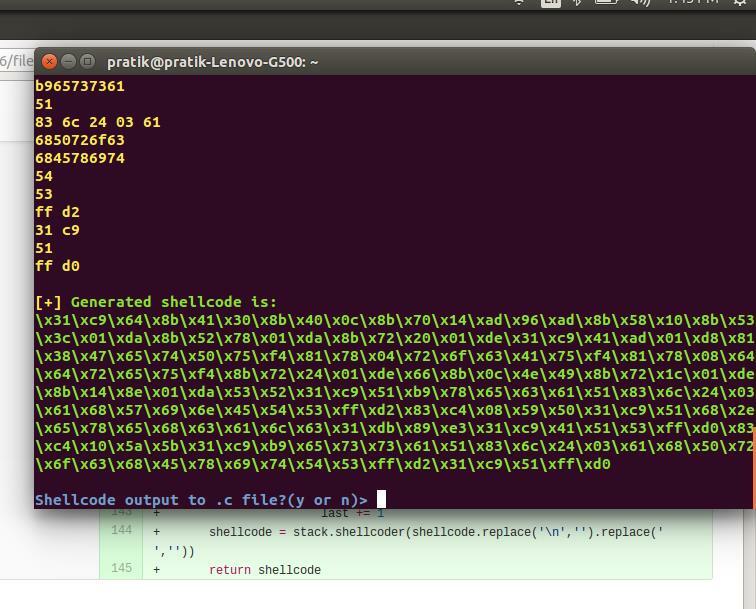 I didn't made post last week so I will be discussing about shellcodes which I did previous week also. I started working on Create Directory shellcode in week 2 and completed it soon as It wasn't big as I used function CreateDirectoryA which is available in kernel32.dll so there was no need to load any dll's into process. Then came the next shellcode Creating File, I thought it would be straightforward Load msvcrt.dll library > Find fopen to create file > find fprintf and use it to write to file > Close file . But when I started to work on it fopen was not working as usual, It was changing stack so I was not able to get the values like kernel32.dll address which I saved in stack for later use. I tried debugging it but couldn't find it as fopen was giving some error values and calling _wfopen and so stack was changing. Using fopen, file was created but stack was not same so I couldn't get values which I saved on stack. I was still able to write code which after creating file, exits successfully but it was getting long. So Ali said about system() which he used for creating linux create file Shellcode. system function is in msvcrt.dll so I loaded it first and then after finding address used it as system("echo data>file"). Here is create file shellcode : https://github.com/Ali-Razmjoo/OWASP-ZSC/pull/47/files . It takes two values one is file name and other is content of file. I am on my schedule and next I will be working on Creating user and adding to admin. I will be using NetUserAdd method or do this part through command whichever would be short. This week I made opcoder that converts the assembly code to opcodes. I worked mostly with the tool, adding windows options to the tool and all. It was made easy because of great tutorial by Ali here : https://ali-razmjoo.gitbooks.io/owasp-zsc/content/English/developers_s1.html . and the second thing that I did was converted static shellcode of calc.exe to dynamic so it can execute any file. First I started by writing that myself and I spent a day on it and then I came across generate function which was there in tool which does the same thing so used that for opcoder. I didn't interact daily with my mentor Brian this week as I was able to do most of my work but I interacted with Ali many times as I had questions with tool. Whenever I ask any doubts to Brian or Ali they reply very fast without taking much time though they are busy with their job. Good to have such active mentors :).Here are couple of screenshots from tool of the options and shellcode generated. I have pushed changes to main repo here : https://github.com/Ali-Razmjoo/OWASP-ZSC/pull/46/files I feel that the opcoder is messy currently but I will document it when I have all the shellcode covered, as with other shellcodes coming I think it will change a lot in coming weeks. I started create directory shellcode yesterday. It was planned to be started at end of week 2 but started in week 3. So to keep going with schedule, this week I should complete Create Directory and Write to File shellcode. I almost completed create directory shellcode as it uses function CreateDirectory which is already in kernel32.dll so I hope remaining time will be enough to compete file shellcode as it is slightly complicated as it requires functions like fopen,fwrite which are present in other dll which needs to be loaded into process. Its time for blog post :). This week was good learning experience. In last couple of post I forgot to thank my mentors for helping me :P. Thank you Brian, Johanna and Ali for accepting me to the project. This week I learned a lot about Shellcode part. My mentor Brian was helping me with all my doubts. Whenever I had any doubts even if its small doubt and I couldn't understand after googling for sometime then I use to ask Brian and he was very helpful. He is always responsive and gives best descriptive answers. So first I started by learning Shellcode in general from The Shellcoder's Handbook and some other resources. I learned about Linux shellcode first and it was good one. And When I switched to Windows Shellcode Part everything was different. It took sometime to slowly understand everything. After reading lot of tutorial, papers and shellcodes I was able to write WinExec shellcode that spawns calc. It was amazing moment when calc spawned without any segfaults :). 1. Find kernel32.dll base address using Process Environment Block (PEB). 5. Then again use GetProcAddress to locate required functions which are needed for writing shellcode. For writing Execute Shellcode we will require WinExec function which is in kernel32.dll. So first we have to find kernel32.dll and then we have to find GetProcAddress and using GetProcAddress we have to find WinExec address and then we can use WinExec and to exit we can use ExitProcess method which is also in kernel32.dll. So for this shellcode we don't need to load any other dll's. Now we have to find offset of GetProcAddress, as offset of functions vary from functions to functions so GetProcAddress is not loaded at same offset for all kernel32.dll. We can use Export Directory table as described in skape paper. The ESI pointer stores the address of exported function names. Now we have GetProcAddress and we will use that to find WinExec function address. unsigned char shellcode = "\x31\xc9\x64\x8b\x41\x30\x8b\x40\x0c\x8b\x70\x14\xad\x96\xad\x8b\x58"
I have to make this shellcode work so that it should execute any file not only calc.exe. I will discuss that with Brian and implement it. I have to also write opcoder now as I got code I can write opcoder and test it. I and Brian are thinking to use some libraries but I have to test library with shellcode and see if it works and discuess with Ali if we can use that library in tool. Completed my final exams and now its time to focus on GSoC project :). In my last blog I posted timeline which was in my proposal and in this post I will add details about Shellcode part of project which I will be completing before mid evaluation if everything goes as planned. There is another way we can do this, by hardcoding the address but we will find the address of modules dynamically using python ctypes. Something like this to get address of module. If I will be able to add the address of module dynamically using ctypes and if it works then I think the shellcode can be developed before time. But If that won't work then I have to use PEB method to get address of required functions. Complete Writing to file SC if it is not completed yet. Add Create directory shellcode. If I am able to complete it before time then I can work start next week work or If more time is left then I can start other new shellcode. This schedule is till mid term and after that I will spend one more week for adding one or two shellcode which are in proposal. I will post timeline for Code Obfuscation modules part while doing the project when I have time in between. I got accepted into GSoC this year and I am so excited to work with open source organization :). 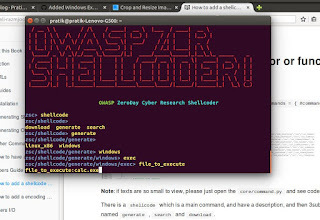 This summer I will be working on my project with OWASP ZSC and here is the link to my project on gsoc site. The project is Windows Shellcode and Code Obfuscation modules. So in my summer time I will be creating windows shellcode and code obfuscation modules for ZSC tool. The coding period officially starts from 23rd May and we are currently in community bonding period. In this period I have to familiarize my self with the organiszation, code base and interact with mentors and make plan about project before the full time coding begins. Here is my proposed timeline that I will be working on during coding period. So basically this project has two parts one is developing shellcodes for windows and second part is to add code obfuscation modules for different languages. I will be working first on shellcode part as I mentioned in my proposal most likely. I didn't write technical details of my projects which are on my proposal about shellcodes and modules on this post but I will write the technical details in next post after discussing with mentors and also more detailed timeline if possible. I will discuss with brian about shellcode part and which way I should go to develop shellcodes as in my proposal I mentioned two ways. I will try to make that discussion on mailing list mostly and if I have discussion on skype/telegram then I will post details on mailing list so that it can be helpful for others also. In next blog I will add technical details for shellcode part and also add more details to timeline.